Listen to this story instead. Since seizing power in 2014, Thailand’s military junta has been rebuilding the political system to repress dissent and control the public. As hundreds have been charged, threatened and sentenced to jail for voicing their opinions, how are politicians and their supporters trying to run a campaign leading up to the elections in 2019? 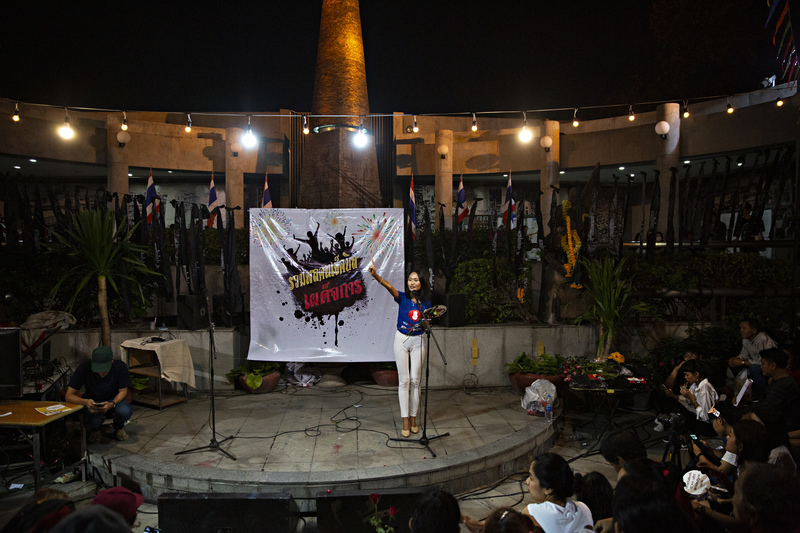 Chonticha Jangrew, the child of a Thai military family, was a university student when she took to the streets in 2014 to protest against the military, which had at that time deposed the democratically elected government. Over the last decade, the streets of Bangkok were awash with protesters and political activists, but Chonticha [in Thailand people usually go by their first name] and her peers couldn’t enjoy the right to protest for long as the newly imposed martial law banned them. Chonticha’s defiant protest was spurred by a feeling that there was something wrong with the military’s decision to take power – or as officials had put it – restore order amid protests over a controversial new amnesty law. Having been raised by strict parents in a military family, she says she knew how ample rules and obedience affect personal freedom. “This is my country, and I should have the right to decide what I want [for the country],” the now 26-year-old told Global Ground. 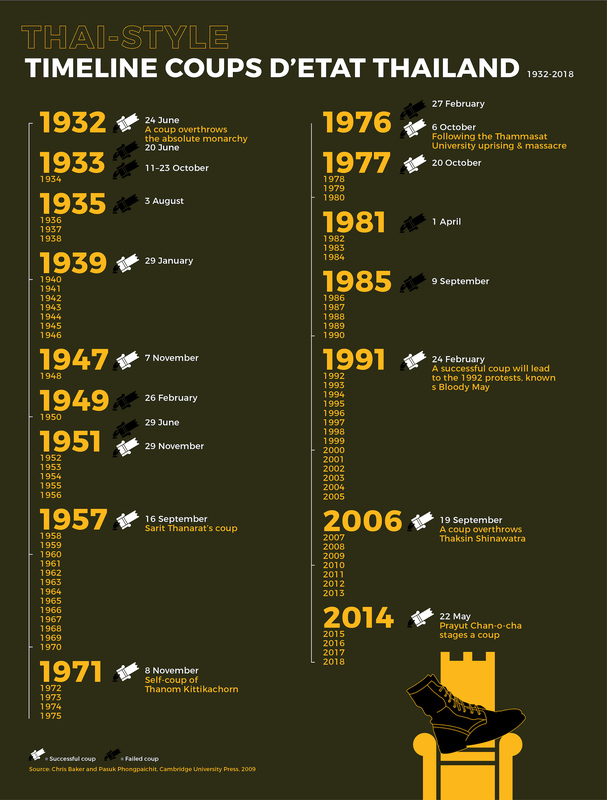 Since the absolutist monarchy was toppled in Thailand in 1932, the country has seen 12 successful coup d’etats. Another seven failed. “We thought that it would be brief, that they wouldn’t stay that long, but we were wrong”, says historian Charnvit Kasetsiri. However, the National Council for Peace and Order (NCPO), the official name of the military junta, and General Prayuth Chan-o-cha, who staged the coup in 2014, are still in power, making it the second-longest running military government in Thailand since 1932. Charnvit compares Prayuth to Field Marshal Sarit Thanarat, who seized power in a coup in 1957, and whose government is remembered as one of the most repressive in Thailand’s history. Under martial law, the military began summoning more than 100 prominent political activists and figures affiliated with the deposed government for interrogation or “attitude adjustments” during which they were isolated for several days. Chonticha, too, was summoned and was only released from a military camp after signing a document promising not to engage in political activism. She had no intention of complying. However, faced with a plethora of laws, orders and regulations that have restricted the Thai people’s freedoms to protest, assemble, or even critically discuss what the government has been up to, activists like Chonticha have had to take a creative approach. “We try to avoid being prosecuted, so we organise symbolic activities,” Chonticha, who helped found the Democracy Restoration Group, says. On the third anniversary of the coup d’etat, the group organised a birthday party to remember that, “because the dictatorship was born,” the democracy was lost. Their fear of arrest and prosecution is understandable: last May, when the group held a march to call for an election, 14 members were arrested. Others have been targeted, too. In the first four years of military rule, at least 876 people have been summoned for “attitude adjustments”, and at least 14 individuals have faced prosecution for not reporting themselves, according to human rights watchdog Thai Lawyers for Human Rights (TLHR). The junta has launched a “steady process of militarisation of administration,” in which “civilians have become military targets,” as martial law has allowed for them to be tried by military courts. Although martial law was lifted in 2015 as the travel warnings released by embassies and the restrictions by some travel insurance companies were hurting the tourism industry, it was quickly replaced by Order 3/2015, which bans political activities and prohibits any political gathering of more than 5 people. This order cannot be challenged by any entity as, under Article 44 of the interim constitution, it was approved under the interim constitution passed by the military, any measure “for the sake of the reforms in any field” is considered constitutional and final. Any of its orders are final, and, according to TLHR, about 400 people have been prosecuted for political gatherings so far. Now that, according to the Constitution, elections have to be held before 9 May 2019, the stakes seem even higher, and those hoping to run face a major headache: How can you campaign in a country where basic democratic rights – from freedom of expression to organising political events – have been dwarfed by fear of being sued and sent to jail? The law that “has become one of the most used tools of [the military] to restrict freedom of expression,” according to a TLHR report, is the pre-existing criminal code law that punishes any insult, threat or defamation of Thailand’s King, Queen, the Heir-apparent or Regent with up to 15 years in prison. These violations, known as lese majeste, were used against 162 individuals since the military took power, many of them for sharing articles online on the new king or memes related to the monarchy. The Computer Crimes Act is similarly effective. Approved in 2007 but amended by the junta in 2016, the law allows not just the injured party but also the government to prosecute anyone who shares information considered “false” or “distorted.” The law has been used against several prominent figures, including the leader of the newly formed Future Forward Party, Thanathorn Juangroongruangkit, who has been accused of distorting facts and damaging the NCPO’s reputation. Historian Charnvit Kasetsiri, the former Rector of Thammasat University, has also been charged under the Computer Crimes Act. Charnvit joined Thammasat in the 70s, when the institution became a symbol of resistance against the military rule in the country and has been deciphering past and current Thai politics ever since. Over the past few years, he has also become an avid Facebook commentator on Thai politics. But, when he posted a comment about the handbag of Prayuth’s wife, he was promptly charged as reported by the Times. He testified and hasn’t heard from the police since. “Their tactic is to show people that you, former Rector of the Thammasat University, can be charged – that nobody is exempt,” he says. While many feel intimidated, Charnvit says that he won’t be silenced. “I cannot be shut up. I have been talking like this for 50 years,” he says, laughing. But sometimes, the military’s strategy backfires. When the hit rap song “Prathet ku mi”, which directly criticises Prayuth’s government, was posted on YouTube in October, the police threatened to take legal action against the rappers for stirring unrest, earning the song even more publicity. “Parliament house is the soldiers’ play yard. The charter is written and erased by the army’s boots,” one of the verses says. Within a week, the song had about 17 million views. Instead of charging the rappers, the military decided to take a chapter out of their book and released its own rap, praising the junta’s policies. Since seizing power, the military has been restructuring Thailand into a watered down democracy in which the military will retain ample power long after elections are held. 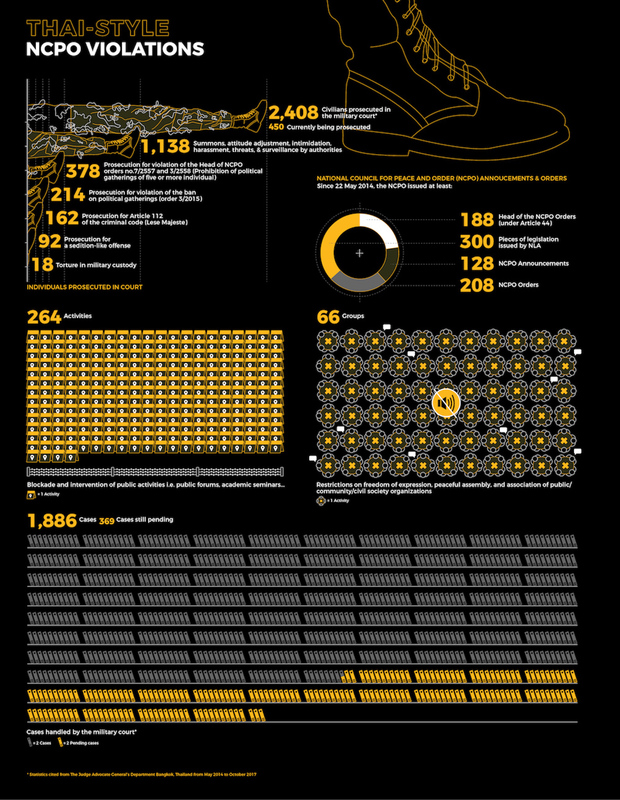 In April 2017, the country got a new Constitution, created by the military. According to the International Federation for Human Rights (FIDH), its provisions erode democratic principles, for example by establishing a five-year-long transition period that will begin after the new National Assembly will be convened next year. During this transition, the senate indirectly appointed by the junta will play a key role in choosing the prime minister. The candidate doesn’t have to win the popular vote, meaning that Prayuth could become prime minister no matter the result of the election. “You cannot beat the junta because they would have the senators supporting them”, says Charnvit — which puts the entire election process into question. The Constitution, with Chapter VII, also establishes a new proportional representation system that will make it harder for any party to win a majority of seats in parliament. “When you write about the Thai electoral system, you don’t know how to name the system because it is so unique”, says Khemthong Tonsakulrungruang, a Constitutional Law Scholar from the University of Bristol. Moreover, the junta has approved a 20-year-development plan which sets most of the economic and social policies for the next two decades and will be binding for any future government. Non-compliance by a government would mean suspension from public offices or from a specific position, expulsion or a prison sentence. “Thailand’s elections are very hostile to the prime minister… If you look at the rules, they make the life of the next prime minister very miserable”, says Khemthong. In this light, the Pheu Thai party, which used to form the government, has hesitated regarding the best strategy in the upcoming elections and has considered simply remaining in the opposition during the next government. “The duty of the party is to try to form a government, but in this situation, if you are in the government, you can do nothing,” says Chusak Sirinil, a Pheu Thai legal adviser. However, in the end, the party decided to fight the junta, says Chusak to Global Ground. In Chusak’s view, the military’s aim is to hinder Pheu Thai from running. “They have the objective of preventing the Pheu Thai [from winning the elections]”, the politician says, pointing at the voting system. Pheu Thai is now crafting a strategy with proxy parties to try to retain as many seats as possible. 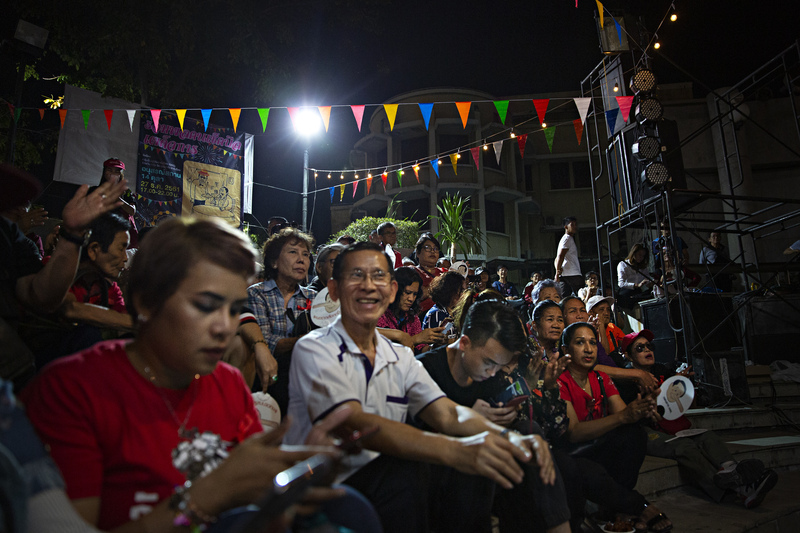 “The essence of this election … is about how to engineer or overcome the system,” says Khemthong. Currently, it is unclear if Pheu Thai will exist in the near future, as an investigation has been launched into its ties to former prime minister Thaksin. Under Thai law, parties can be dissolved if they are found to be influenced by non-party members. Only recently, on 11 December, did the government lift its ban on political activities, but not before several Pheu Thai members had been charged, including Chusak, who was charged for holding a press conference earlier this year. Despite the current environment, 96 political parties have registered to run in the election as of early December, according to the Election Commission. About a third of them are new and found members among the activists’ ranks. Rangsiman Rome, a well-known activist and law student who has gotten used to detention and court hearings – a total of eight cases against him are pending – has joined the Future Forward party. “I joined the party because I thought it was a good start to unite people and bring democracy back to Thailand”, says Rangsiman. But with his cases pending, he’s juggling campaigning with appearing for court hearings. Having to testify every few weeks is exhausting, Rangsiman says, but his biggest worry is his political future since being found guilty of one of the charges would mean he’s not allowed to run in the elections. However, the main hurdle so far has been the permanent surveillance from authorities, who take photos and film him when he meets with potential party members. “How can people believe that they will be safe after [attending a political event]?”, he says. Things are also difficult for the new political organisations due to a number of new requirements for political parties. “The new Constitution and law require a lot of conditions [that we have to meet in order] to submit [our application]”, says Chumaporn Taengkliang, Deputy Leader of the Commoner’s Party, which was founded in March. The law requires parties to put down at least 1 million baht (around US$30,000) as initial capital while each founder has to pitch in at least 1,000 baht. In addition, each party is required to have at least 5,000 paying members and add at least another 5,000 members within four years. Despite all the constraints and the high toll they are paying, many keep the fight going. Chonticha is now constantly moving to new places to avoid being followed by the police. She has installed cameras around her parents’ house to deter the authorities from bothering them. “I don’t feel safe in Thailand anymore, not only from [police] officers, but also from Thai people,” she says, explaining that her neighbours, who didn’t agree with her activism, had threatened her. Even if the elections are held, she says, she expects that the current military leaders will hold on to power. Editing by Denise Hruby and Anrike Visser. Audio story by Melanie Hall. This article is protected by blockchain.